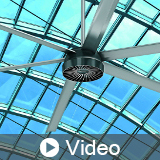 We invented the big industrial ceiling fan – also known as the High Volume, Low Speed (HVLS) fan – and have continued to be a leader in the market by developing the most innovative large fans in the world. We continually strive to push boundaries and set the bar when it comes to engineering and product development. The technology of our fans is based on the principle that moving air slowly is far more efficient than moving air quickly. MacroAir fans move air down and out in all directions. This keeps air fresh and helps people and animals feel more comfortable. Our product’s are unparalleled in energy efficiency and airflow. They are assembled in the USA and installed worldwide. Customers benefit from local service and highly customized solutions from MacroAir’s global distribution network.